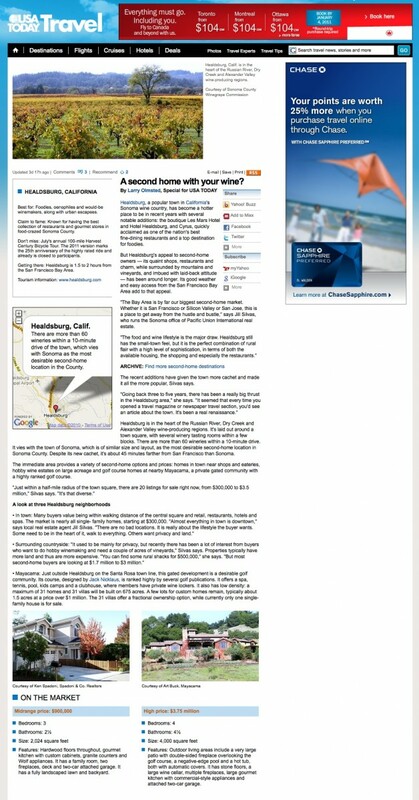 The charm of Healdsburg is showcased in this article in USA TODAY – December 2010. With a downtown reminiscent of Mayberry, several fine dining restaurants, world-class vineyards and a laid-back attitude, Healdsburg is a draw for many Bay Area residents looking for a second home. John Silvas, who runs the Sonoma real estate office of Pacific Union International, says that home buyers from throughout the Bay Area come to Healdsburg to “get away from the hustle and bustle.” A wide variety of home options and price ranges are available in and around Healdsburg, from $300,000 single family homes within walking distance of town to Mayacama, a gated golf community that features a spa, tennis and clubhouse. If you are considering purchasing real estate in Healdsburg, we invite you to explore our current listings.